Another full remake in the style of the recent Crash Bandicoot N. Sane Trilogy or the 2017 Shadow of the Colossus (we also know about Final Fantasy VII and Crash Team Racing re-dos coming soon), this year we finally get our hands on the treatment for Resident Evil 2. It’s not the first game in the series to be remade (there was a newer version of the original game created years ago), but it happens to be one of the strongest entries in the franchise, and when I first heard about this in 2016 I knew I’d want to play it. Unfortunately, due to moving and looking for work, I knew I wasn’t going to be able to get myself a copy when it first came out. I figured I’d wait for a sale and get it later on this year, but then my lovely woman gifted it to me for Valentine’s Day (thanks babe!). Let me first note that I have only put in about 3-4 hours so far, so these are early impressions, but I can still elaborate on the pros and cons that I’ve seen so far. 1998 was a long time ago. I was sixteen when this game released, and probably a little bit older before I first played through it. You’ll have to excuse me if my memories of the original game are a little fuzzy. It’s likely that I’ll talk about not remembering something, or thinking something was different and perhaps it was just like the original. I have to say that the game feels new and different simply because the over the shoulder camera view from games 4-6 is back — a difference from the locked cameras of the original, and the latest game in the series that moved to first person camera. One thing that immediately stood out to me is the introduction. 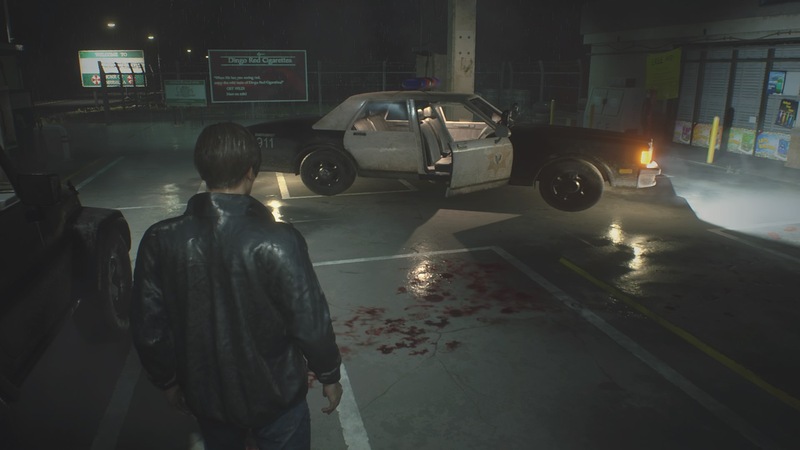 It feels completely new, as I don’t remember starting out at a gas station before hitting the Raccoon City Police Department; I just remember a short scene and then being there. Perhaps that’s just my memory playing tricks on me. The graphics are pretty amazing though. They’re similar enough to Resident Evil VII in quality, and as I said having the free look camera allows you to see all of the little details. Before long you are at the front of the RPD, as expected. The game progresses from this point (and to the point I have played so far) as a sort of mixture of nostalgia and a whole new experience. We’ll go with “New Nostalgia.” The mood feels appropriately apprehensive but there haven’t been any jumpscares that I can recall. I’ve felt anxious for sure, but I sort of feel like I know what to expect at the same time. The gore level seems to have been turned up a notch, even compared to some of the newer titles. Obviously they didn’t have the technology to pull off these visuals back in 1998, but even in the 2010’s games it didn’t look like this. I’m not put off by it, zombies aren’t exactly friendly and I want to feel the tension even if I am not jumping out of my seat. What’s most familiar is the item box, typewriter and inventory/crafting systems. I remember spending plenty of time having to micro manage my inventory while exploring the game the first time around, and this remake is no exception. 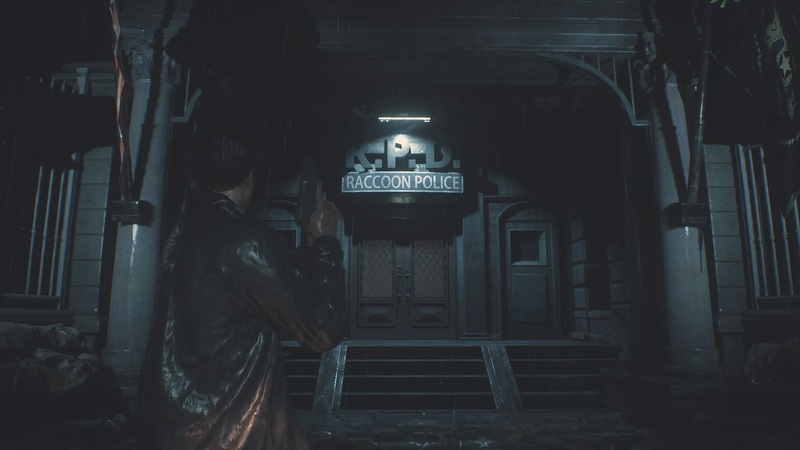 You’ll find keys, puzzle-solving items and supplies as you comb through the police station. Mixing herbs is back, and a new system for crafting bullets is in place. Your knife now serves the purpose of being able to directly slash enemies and get past certain barriers, it can also help you out of being grabbed by an enemy by giving you a counter attack. The police station feels familiar in that it looks to be laid out in a very similar fashion, and certain set pieces are reminiscent of the original. However, it does feel that this is a completely different place. My memory tells me to watch out for the Tyrant, and there will be parts outside of the police station, but I’m not sure if I’m mixing up my games at this point. Whatever the case, I’m very happy with this remade edition of one of my favorite Resident Evil games. At this point I have just found the shotgun and encountered my first licker. Good times! I hope to be done with Leon’s campaign within a week and on to Claire’s after that. By then I should be able to afford a copy of Anthem! I’ll be back with more thoughts once I’ve completed the title.